There was a time, not so long ago, when nobody worried too much about the shape of the rooms that led off the corridors of power. But the pressure on UK finances has politicised the design of the UK’s public buildings. The latest example of this was the recent announcement in Parliament of a report that, amongst other things, called for a new approach in the way facilities are designed to deliver better services in a more cost effective way. The report Restarting Britain 2: Design and Public Services was the result of an eight-month investigation led by the Design Commission along with politicians, designers and civil servants. The report looks at how design can be used to improve the delivery and cost effectiveness of public service provision in a number of areas. It makes the case for a wide range of changes including the use of better design principles to focus more on the users of public services rather than providers, greater awareness of the nature and role of design within the public sector, improvements to the commissioning and implementation of design and an improvement in the use of information as a prerequisite of decision making. It is far from the first time that the UK Public Sector has been called on in recent years to apply design to change the way it delivers services and uses its facilities. In 2011, the communities secretary Eric Pickles announced the results of a long awaited report called ‘Leaner and Greener: Delivering Effective Estate Management’ which made fifteen recommendations which would make savings in the way the public sector estate was designed and managed of around £7billion a year. It wasn’t the only initiative. At around the same time the Prime Minister announced that a new form of property vehicle which owned and managed the government offices estate should be free to charge departments a ‘market rent’, building on ideas developed by the previous Government. The property vehicles were originally announced in former Chancellor Alistair Darling’s final budget and it was the now defunct Office of Government Commerce (OGC) which ignited an initial discussion about the design and management of Government property in 2009. The report it produced at that time alongside property specialist IPD – Efficiency Standards for Office Space – led to OGC producing some pretty jaw dropping recommendations. It said that the entire estate should be subject to an overhaul in the way it used space with the ultimate aim of saving around £1.25 billion of the annual £6 billion running cost. It claimed the key factor in driving this saving was interior design and specifically changes to the way that space was allocated in its office buildings. It recommended an allocation of 10 square metres per person of net internal area for all new projects and major refurbishments and 12 square metres per person for all other projects. Other changes introduced around this time included the lease moratorium which meant a ban on signing new Government leases that was first imposed for a period of ten months, but was then extended to 2015 and across a wider range of properties. At the same time the Chancellor announced in his 2010 budget that the government would reduce public sector infrastructure and construction costs by 20 per cent through better procurement processes and the creation of new procurement models with the intention of saving around £3 billion-a-year on infrastructure by improving procurement processes. Since then initiatives and reports have continued to pile up. The Government has looked to the web to rid itself of unwanted properties. It has looked to share procurements services across both local and central government bodies. It has looked to increase the uptake of flexible working in the wake of its experience during the Olympics, including in the Cabinet Office’s ideas of creating co-located spaces across London. It has developed its interest in BIM, including through the Government Soft Landings initiative. The list goes on. The results of this brew have been mixed to impressive so far. The various initiatives have seemingly helped to boost London’s economy and cut costs. The Government has divested around £1 billion in unused space. On the other hand, while there have been improvements to the way procurement functions, there is still work to do especially with the ongoing failure to engage SMEs. Central Government departments still have a variable record on their use of space, even if we allow for unavoidable mitigating circumstances including the legacy of old, inappropriate and listed buildings. The latest news is that the Home Office and the Department for Communities and Local Government (DCLG) are to move into a single central London building next year. The move will see DCLG leave Eland House and take up spare office space at the Home Office’s headquarters at 2 Marsham Street. The move is expected to help reduce the cost of the civil estate by £24m per annum. What is lacking in all of this appears to be any sort of joined up approach and an ability or willingness to follow through on initiatives and report on them. Instead we often see policies and ideas represented as something new when they are often a rehash of leftovers from previous thinking. The perfect example of this is the Leaner and Greener report which was launched just over two years ago and updated last year, but which shares clear overlaps with other reports and initiatives and is still lacking any effective reporting of how it has helped to meet its own aims. While you can’t argue with the overall aims of such reports, it would be more useful for the public sector to work with a clear vision of how it is to approach the design and management of its property and resources and to report on its outcomes in a structured, cohesive and timely way. Nobody would argue with the content and conclusions of many of the current slew of initiatives and reports but it’s never easy to keep up as a onlooker, never mind for those charged with implementing them. It was Dieter Rams who famously described the approach of some people towards design as ‘putting lipstick on a gorilla’. 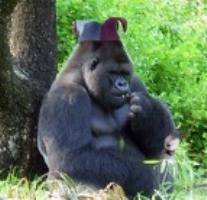 Sometimes when it comes to the public sector’s approach, it can seem more like putting the gorilla in a new hat on a regular basis and telling us each time it’s a different gorilla.